I recall with pleasure our lunch at Cook & Book in Brussels some years ago, when your first novel Underwater Vibes was still evolving, and you asked for feedback. Now you’ve not only published it but are also releasing its sequel, Broad Awakening. So, like the karate teacher who sees a pupil finally smashing bricks, I’m happy to congratulate you on your success. Would you tell in a nutshell what both books are about? 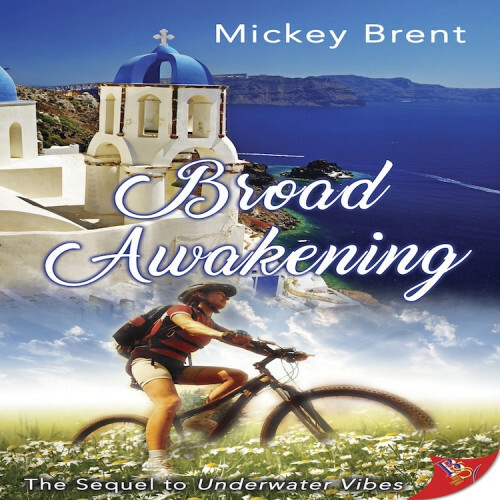 The sequel, Broad Awakening, is a continuation of a complex love story that started with Underwater Vibes. Both Hélène and Sylvie, the main characters, evolve in the sequel. They find “ruts in their road to bliss,” as indicated on the book cover. The story carries certain cultural misunderstandings, language issues, and personality differences, yet despite these hindrances, both characters continue to feel a heightening attraction to each other, which includes a healthy dose of sexual tension; both grow stronger as the story unfolds. The sequel has several delicious scenes from Santorini, Greece, where Sylvie was born and raised. Both books include plenty of food, because I’m a total foodie, and I like to write about delicious Greek delicacies, and gorgeous island scenery. Are your characters based on real people, or completely invented? I completely invented my characters. However, some of their characteristics were inspired by people I’ve known in the past. Parts of Sylvie’s and Hélène’s main occupations, for example, were very close to home. Hélène is a scientific translator in Brussels, and I was also a scientific translator in Brussels for several years. Sylvie teaches swimming, and I taught swimming for a summer. She’s also an amateur photographer, and so am I. They both like to bike, and I’ve biked for most of my life. In fact, I didn’t own a car until I turned forty, which is not typical for someone raised in the USA. I biked everywhere, even in the rain and snow. Now that I own a car, I’m gaining weight… Which is a problem, because I’m constantly comparing myself to Hélène and Sylvie, who are always doing sports and staying slim. The novels are set in Brussels, obviously because you know it. What locations especially attracted you? I lived in Belgium for seventeen years, and ten of those years were in Brussels. I’m very familiar with Brussels, and its rainy weather. I had my protagonists visit Parc Cinquantenaire, where I used to walk daily and do summertime sports. Hélène lives in the diverse neighborhood of Ixelles, where I spent six wonderful years, and where I used to buy fresh produce at the lively farmer’s market where Hélène and Sylvie first meet. Sylvie lives in Forest, where I used to bike through its tree-lined streets, and I wrote about several other familiar spots in Brussels. Surprisingly, when I first introduced Underwater Vibesto potential agents and publishers in the United States, I was told by several of them that I should set the story in Paris, France. One agent insisted that Americans wouldn’t be interested in reading a novel that took place in Brussels because, apparently, Americans don’t know anything about Brussels. I was surprised by this response, since Brussels is a vibrant multicultural city that is often featured in the news, and it happens to be the capital of Europe. I informed them all that I wouldn’t change the location of my story because it is culturally very Belgian, and I didn’t want to set it in Paris. I preferred living in Brussels. That’s why I stayed there for seventeen years and set my story there.